A week or so ago, I spent two whole days sorting piles of accumulation in the studio -- things people had given me, things I'd picked up at garage sales. 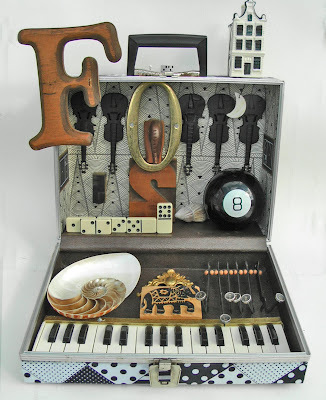 While doing so, I again wondered how I would ever give up my precious 8-ball in an assemblage -- that it would have to be a really good reason! Then, the tacky silver violins got sorted into the "silver box" and the domino's into "games and toys box." When I picked the elephant and saw how the trunk pattern matched the violins something clicked, but it wasn't until I reached for the nautilus shell (then whole) I began to understand....numbers! Numbers....music...FIBONACCI!! Then, suddenly, the domino's made sense too -- but the elephant -- how would that fit...and then, taDAH ... of course, "Fibonacci's Trunk!" Even the old typewriter keys look like "notes!" For those who don't know, in 1201 the Italian Leonardo of Pisa (known as Fibonacci) presented the numeric system that describes the growth patterns in biology 0-1-2-3-5-8, and so on. But Fibonacci news wasn't really "new" as this beautiful mathematical principle dates back to ancient India and early Sanskrit texts. During April, this piece will be on display (and for sale $500) at Many Hands Gallery in Old Town Eureka, but I also have two other pieces in exhibits: "Tears of the Phoenix" is up at the Morris Graves Museum of Art, and "Fire and Ice" is on exhibit at Eureka City Hall.